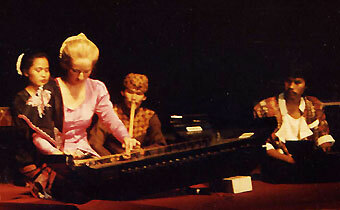 Solo singer and musician playing the Indonesian Kacapi (floor zither) or a smaller lap version both of which sound like an Asian harp. Here's a fabulous way to add mystical atmosphere to weddings, dinners, receptions, festivals, Asian, Balinese or Indonesian themed private or corporate functions and events. Based Sunshine Coast (near Brisbane), Queensland (QLD) Australia. Kari is an artist and musician; a creative innovator, multi skilled performer, a teacher and musical/artistic director. She has won two scholarships to study at ASTI (the Academy of Music) in Bandung, Indonesia, and has completed a degree in Indonesian Language and Ethnomusicology in Australia. She speaks fluent Indonesian. As a musician and tour manager for Back to Back Zithers, a multicultural quartet, Kari instigated and co-ordinated their successful tour of Java and Bali. Their CD "Quivering String" was released in 1992 including several of Kari’s compositions. Kari is a sought after teacher & trainer in Indonesian culture and Asia Studies. 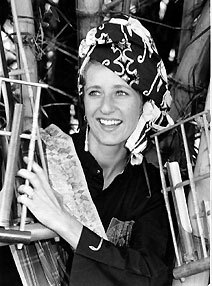 She has conducted countless workshops in traditional bamboo Angklung Buncis, ancient Indonesian community folk art form, music and dance. Kari’s ensembles of performers have appeared at several festivals in Queensland and Victoria here in Australia and also in New Zealand. Kari can perform for you in traditional costume or a modern, more contemporary, Asian style of dress. She offers music and song on the Kacapi: a 20 string lap zither used for weddings and private functions or, for grander events, a larger version seen at the top of the page and here on the left. Both Kacapi sound very similar. Kari's performance is ideal entertainment for adding an oriental or Indonesian / Asian feel to your wedding, reception, cocktail party or any themed private or corporate function or event.